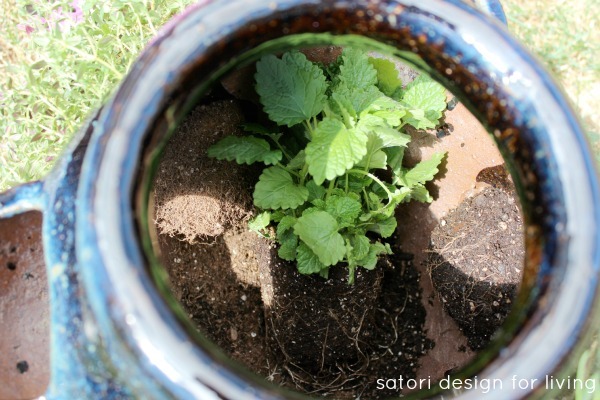 Create a strawberry pot herb garden in a few simple steps. Space saving and delicious flavours to use in summer fresh dishes all season long! Every spring, I like to plant a variety herbs. Nothing beats fresh basil in a salad or rosemary infused chicken, right? Last year, I created a kitchen container potager in a burlap planter, which ended up yielding a good amount of produce. However, with all of the heavy rain we had, moss started to grow on the outside of the burlap container making it look pretty shabby by the end of the season. This time, I decided to create a strawberry pot herb garden, which ended up taking less space per plant than a regular planter. My hope is that it will look better over time as well. If you’re tight on space in your yard or balcony, a strawberry pot is the perfect solution. Once they’re filled in, they look great too! 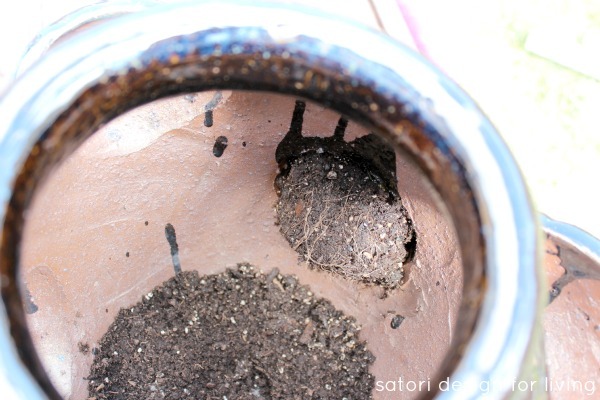 To begin with, place a small layer of rocks at the bottom of the strawberry pot to cover the drainage hole. Next, add a base layer of potting soil (about 2″ deep). 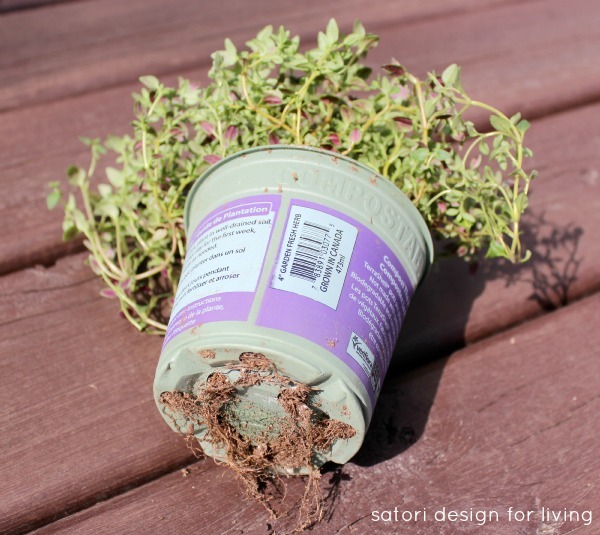 Start feeding one of the herb plants (trailing plants are good to start with) through a bottom pocket from the inside of the pot to the outside, being careful not to damage the foliage. Continue planting until all the bottom pockets are filled, following with the top ones. Repeat the same process of feeding the plants from the inside of the pot to the outside. If any herb plants are root bound, carefully pull some dirt away and loosen the roots before placing in the pot. To create a watering channel, place the cardboard tube in the center of the strawberry pot, pushing down into the base layer of soil. It should be about 1-2″ from the top. 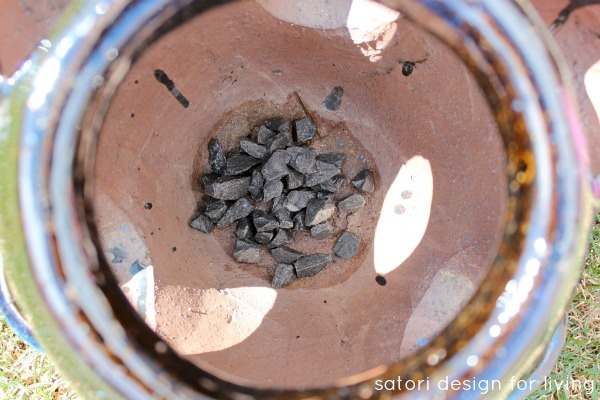 Fill the tube with rocks to the top. 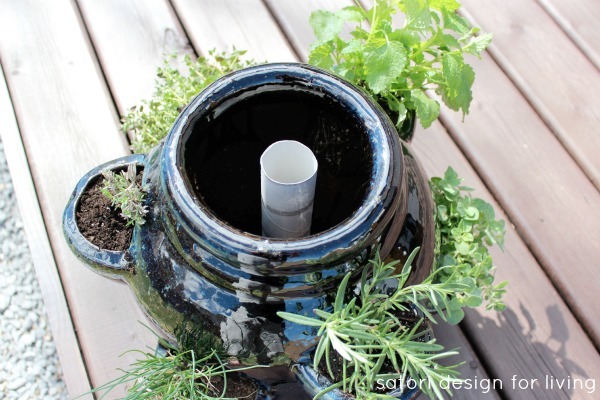 Begin adding potting soil around the tube, packing lightly around the plants as you move upward. 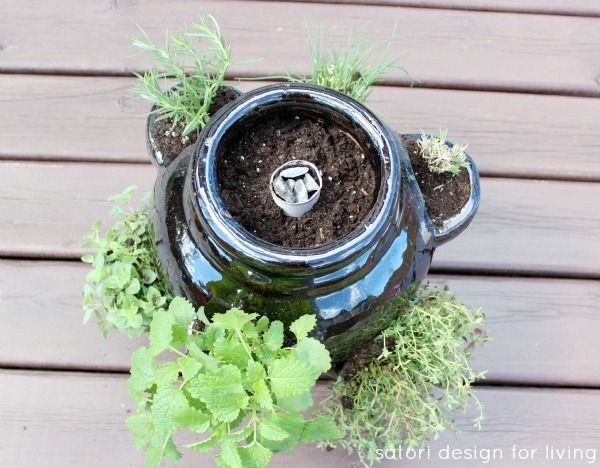 Finish by planting herbs in the top of the pot between the watering channel and the edge of the strawberry pot. It’s important not to crowd the plants so they have room to grow (I only planted two basil plants as they will fill in over time). Add more potting soil to fill in any gaps. Give everything a light watering, both on the top of the pot (pouring slowly into the watering channel) and into each pocket. This gets water right to all of the roots rather than just the foliage. The cardboard tube will fall apart in no time, leaving just the rocks down the center. Herbs like it best in a sunny spot and like to be moist but not soggy. Water your pot often if it has west or south exposure. To use for cooking, simply cut or pinch off what’s needed. Most plants will re-grow throughout the summer. Keep them trimmed often for best results. 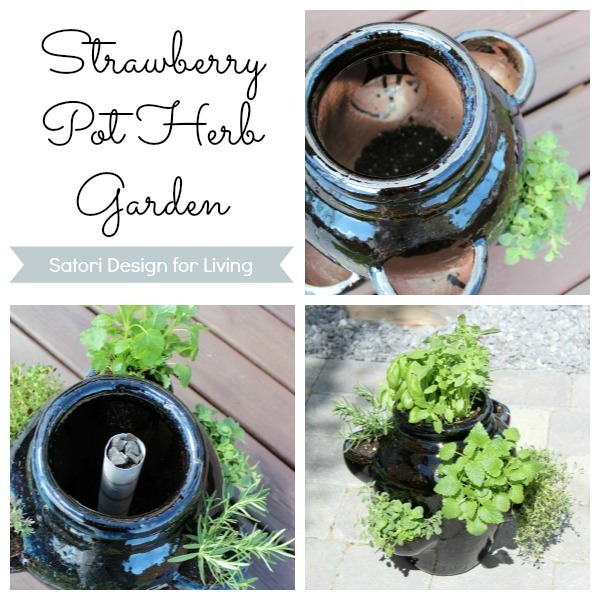 Pin this Strawberry Pot Herb Garden for later! 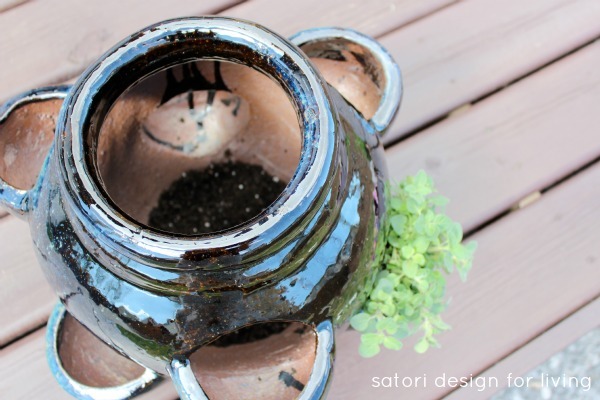 Want to see more gardening ideas like my strawberry pot herb garden? Come back tomorrow for the Outdoor Extravaganza Plants & Flowers link party. I can’t wait to see your inspiring projects! 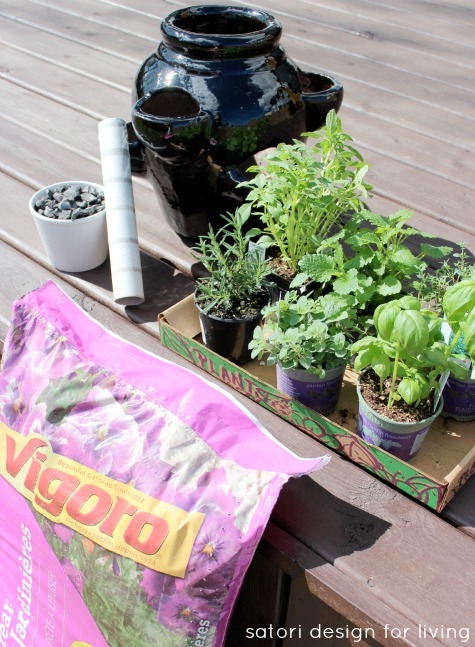 As well, check out these other ideas for creating a container herb garden by some of my fellow bloggers. Looking for other strawberry pot ideas? Succulents look great in them too. See more HERE. 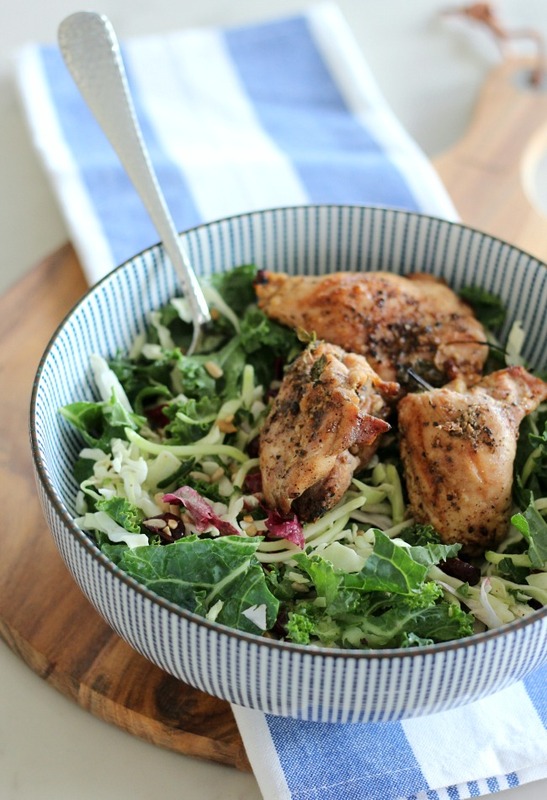 Finally, here’s a delicious herb-infused grilled chicken recipe you should try this summer! I love that style pot! You are going to have so much goodness! 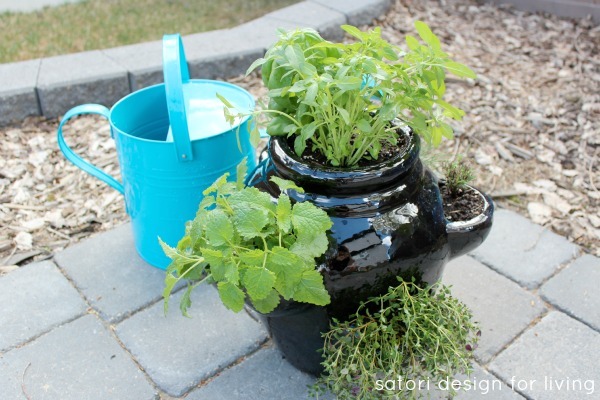 Hopefully you will share some recipes with your home grown herbs! I definitely will! We actually had greek chicken last night and the oregano was from the pot. So handy and you can’t get any fresher! 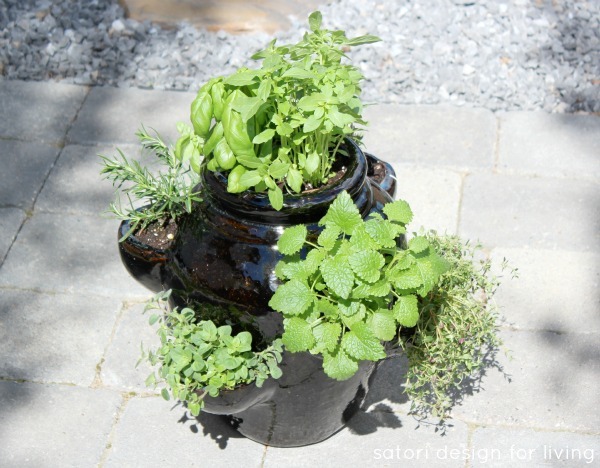 I love the idea of using a strawberry pot for herbs. I usually plant them all jumbled in one big pot and by the end of summer you can’t tell who’s who. Maybe this year I will have to pick myself up a strawberry pot. Would be cute with little sticks to label them too. I find you either have to do them in a large planter/pot or in a garden. We’ll see how this works out (I know I will have to keep them trimmed often). Last year I did mint in its own pot, and thank goodness I did because it really takes off. Great for summer cocktails and cooking though! good luck with those herbs! that is one thing I can never keep alive. I’ve had really good luck with herbs in the past. If anything, they get too big! Try a sunny spot in your yard and they should be okay. Some are pretty easy, like chives and rosemary. This looks so nice! I decided to plant my herbs in the ground this year and went with a theme…everything that is used in Herbs de Provence. I get hungry every time I get near there and smell the basil and rosemary. I keep thinking I might try to cut some clippings from each and transplant them into a pot on the deck just for the scent alone! This one is so pretty! Thanks Dawn! I tried lemon balm for the first time and then went with my favorites- chives, oregano, rosemary, thyme, basil (2 types) and lavender for its beautiful scent. I’ve never heard of a watering channel – I will definitely use that one! This is a fantastic tutorial, Shauna, and I can see we were on the same page! I also potted up herbs, but didn’t have your tutorial under my belt or I would have integrated the watering tube with the rocks – that’s brilliant!! 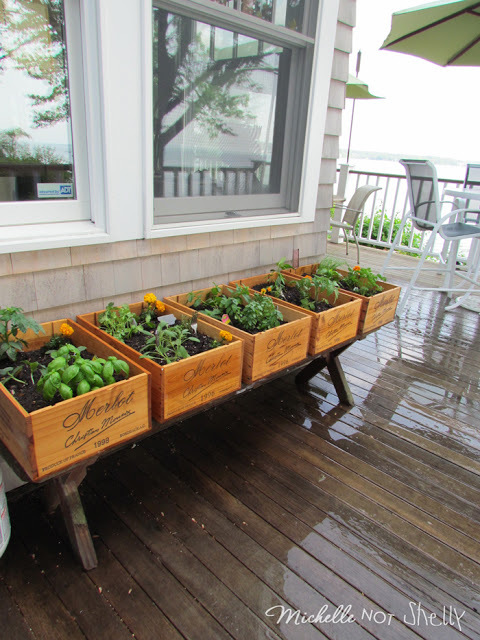 Thanks for sharing, and happy herb growing! PS – I fell in love with your burlap bins last year, but couldn’t find any to do up my own – I’m happy you followed up with the pros/cons of how that went! We’ll see how the watering channel goes. I’ve seen it before, and it makes sense. I think the burlap would be okay during a normal season. We got so much rain last June and everything was water logged and even some of my regular planters started to rot. I’m not using that moisture holder soil this year for that reason! Looks great! You take really nice pictures of the process and good tips too! I think sage is pretty aggressive, and that’s probably what did it. Sometimes it’s trial and error! 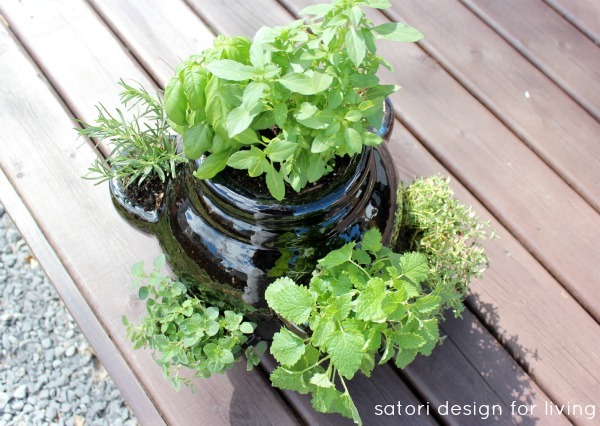 I just planted up my herbs last week too – I used a large pot this time but I’ve used strawberry pots in the past too! It’s so great to have fresh herbs on summer salads! I’ll definitely need to keep them trimmed up, but that will motivate me more to use them often. Hope yours turn out good! Looks so great! 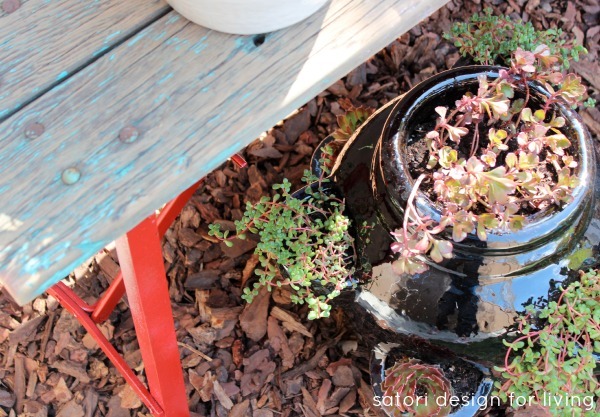 I have one of those pots sitting in my garage – and you just gave me an idea! Thanks! Genius! 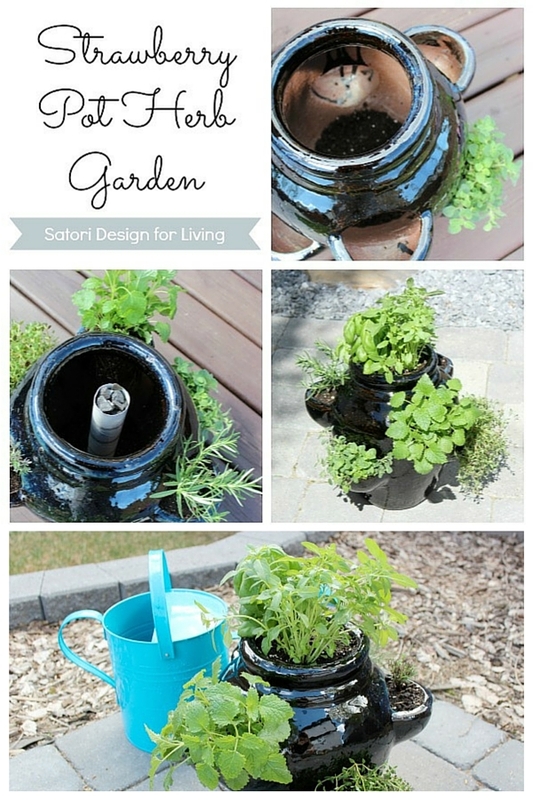 I have one of these pots and never thought about the watering tub idea. Thanks for the tip! There really is nothing better than having fresh herbs in a summer meal, is there? Yum! We do basil, green onion, cilatro, rosemary, and yes, mint … the mint takes over everything! I’ve always wanted to use a strawberry pot but was afraid to try strawberries — herbs are brilliant! And you reminded me of a favorite goat cheese, fresh herb and sun-dried tomato crostini recipe! I’m going to make that this week — thanks for the inspiration! May I know if I need to remove the cardboard tube after all the plant and soil goes in? since its a watering channel… sorry I am a newbie. Coz in my mind, its just there temporarily to create the shape of the channel. Hi Toety, You can leave the cardboard tube in as it will break down over time with each watering.